Home Depot Christmas Light Exchange! You are here: Home / Great Deals / Home Depot Christmas Light Exchange! It’s time for Home Depot’s Christmas Light Exchange! 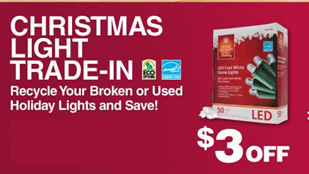 Beginning today, November 5 – 15, 2014 – you can trade in your old Christmas lights and get $3 off an LED light string for every incandescent light string you recycle up to 5! They do this once a year for just a few days – so, don’t miss your opportunity! November 5, The Home Depot begins its second annual Eco Options Christmas Light Trade In event. Customers can bring in their old working or non-working holiday light strings to be recycled and receive a $3 off coupon towards the purchase of energy efficient seasonal light-emitting diodes (LED) string lights. Customers must purchase their new LED lights between November 5 and November 15 and are limited to five redemptions. This event will also be valid at all The Home Depot U.S. stores. LED lights are shown to use 80 percent less electricity than standard mini lights and last up to 10 times longer. This holiday season, The Home Depot will carry traditional white and multicolored ENERGY STAR qualified LED lights that offer superior connectivity – allowing consumers to link up to 87 strands (or one-quarter mile) of lights off of one outlet without the scare of overloading the circuit.